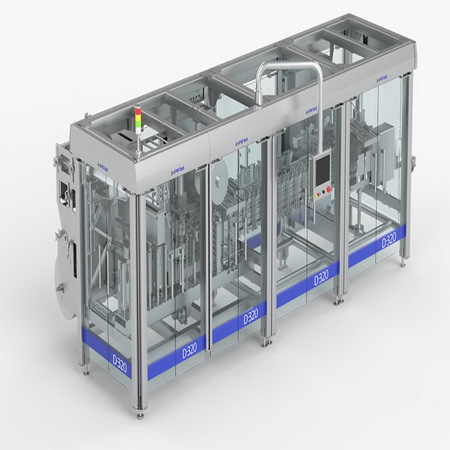 This machine is the latest designed and manufactured liquid automatic packaging machine. It specializes in packaging the liquid products into vertical shaped pouches (capped stand-up pouch). The products packaged by this kind of machine have the characteristics of standing up, without falling, and increasing the showing ability of the store shelf to the maximum. And they can provide the customers the most convenience. And the products can be capped after several uses. The machine has a pneumatic transmission system with a reliable operating system being ensured. It is controlled by a computer, and with an easy operation and adjustment being provided. The machine can automatically finish the processes of pouch forming, filling, dosing, sealing, capping, and date printing, etc. The machine adopts the photoelectric probe unit in the packaging process to guarantee the completeness and the beauty of the pattern. The machine adopts ribbon hot print technology as the date printing system to ensure the clearness of the characters. The machine is capable for the composite packaging materials (films) as PE/PA/PET, PE/PA, PE/PET, PE/BOPP, PE/AL/PET, etc. and as well as liquid chemical products.